Pioneertown is not your ordinary Southern California metropolis. In fact, counting dogs, cats, burros, sandcrabs and humans, this tiny city on the outskirts of Yucca Valley has a population of about 60 — and that’s stretching it a bit. But what it lacks in size, it makes up for in enthusiasm. For instance, what other town in the world has only four business establishments, and three of those four establishments are bars and the fourth is the U.S. Post Office? Pioneertown may be small, but it definitely isn’t boring. Take last Sunday, for example. There was a shootout right in the middle of Main Street. And then, long before those bodies even had a chance to cool, there was a hanging. 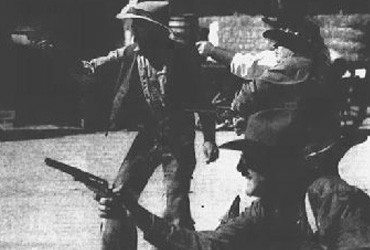 What’s more, there will undoubtedly will be another shootout this coming Sunday and probably another hanging — all featuring stuntmen, of course. And after the dust has cleared, locals and tourists alike will jam into the saloons to dance and sing and carouse. “Yep, things are generally pretty lively around here,” says Red Dog Saloon manager Bill Anderson. “But it wasn’t always this way. In fact, back in the late 60’s and early 70’s the town almost died. You see, both the Red Dog and the Golden Stallion saloons burned down. It was ca-ta-strophic,” he sighed, remembering that dull period in the town’s history. Of course, Pioneertown residents do have their spiritual side, too. Things aren’t all fun and games. In fact, every Sunday morning, they attend church services. Fittingly enough, these services are held in the saloon. 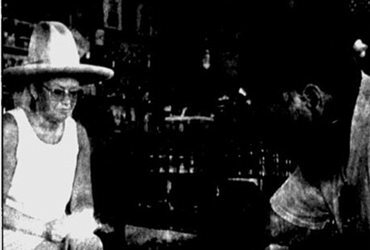 It’s not surprising that life in the tiny desert town revolves around the community’s saloons. After all, local folks have a reputation to live up to. Pioneertown was created in the late 40’s by a film company which wanted to reproduce a bawdy, boisterous, authentic-looking western to use for movie sets. The Hollywood genies waved their magic wand over the barren desert floor and, lo and behold, a marshall’s office, a trading pose, a small school, various and sundry saloons, a livery stable and about 20 other 1880-style woodframe buildings appeared. Eventually Pioneertown began to fall out of favor with film-makers and the desert elements started to reclaim some of the seedier, built-to-look-ramshackle buildings. But before the town had a chance to disappear completely, it was resurrected by a new group of residents — many of them retirees who found the desert climate invigorating. Some of the newcomers built homes on the nearby hillsides, others set up housekeeping in the remaining old buildings on Main Street. A visitor walking down the dusty, unpaved street can see a score of the original structures, the paint peeling from signs carrying such legends as “Likker Barn,” and “Golden Spur Trading Post.” But instead of being business establishments, the buildings have been converted into homes with curtains at the windows, lawn chairs on the porches, and laundry flying from clothes lines at the rear. “At one time, there were 27 business houses here,” boasts bartender Anderson. 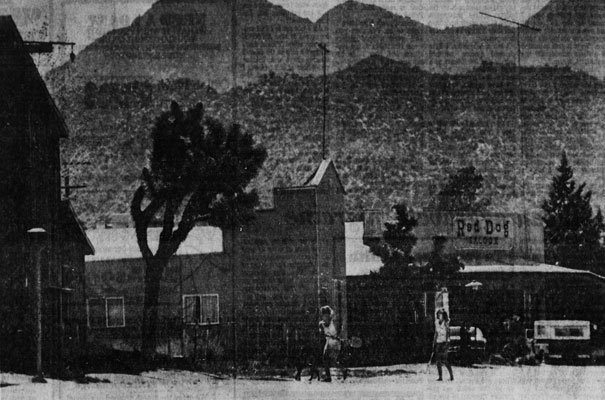 “In fact, we were bigger than Yucca Valley.” All that now remains is The Cantina bar, Anderson’s Red Dog Saloon, the Pioneer Bowl and bar, and the Pioneertown, U.S.A. Post Office (Zip Code 92288). A nearby motel is only open sporadically. And it’s true that on weekdays you can spread out a beach blanket in the middle of Main Street, stretch out in the sun, and not have to move a muscle all day. The only thing that might disturb you would be a whirlwind as it danced down the center of the empty, rutted street. 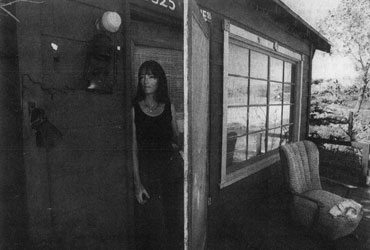 But those same small-town characteristics that some city dwellers might see as faults are considered attributes by Pioneertown residents. Although the town is relatively quiet on weekdays, Pioneertown residents see to it that they don’t waste the weekends. That’s when the best rabble-rousing takes place. To ward off boredom (and attract tourists), Anderson hires The Bravados, a group of western performers and stuntmen, to give shows on Main Street each Sunday at high noon. Entrepreneur Anderson also brings in a preacher each Sunday morning at 8:30 for services and hires a country and western singing group. “The Over the Hill Gang” to perform in his establishment on Friday and Saturday nights and Sunday afternoons. “I try to do my bit to keep the town from fading away,” he says modestly. The promotional gimmicks seem to work. Tourists swarm into town, some camping outside the village at a rate of $1 per person per night, others just stopping by for an hour or two to enjoy a beer. Since the countryside surrounding Pioneertown is a starkly beautiful jumble of ragged rocks, sagebrush and yucca plants, many come to the area merely to hike ride or picnic.